This falcon camera is brought to you by the MNDNR's Nongame Wildlife Program, which helps over 700 species of Minnesota wildlife thrive. The program is largely supported by donations from people like you. This year, we celebrate forty years of effective conservation. Note: There is no audio available with this camera. Note: This is live video of wild birds in the natural process of raising their young. Life and death struggles occur all the time in the natural world. DNR staff will monitor this camera and will evaluate incidents as they occur, but we do not plan to, nor do we condone, any interference with this nest or its occupants. Rewind video for instant replay: Click anywhere on the orange timeline bar below the image to go back up to 4 hours. Click on the "LIVE" button to return to the live feed. Make the video full screen by pressing the double arrow in the lower right. To escape from full screen, press the ESC key, or tap "Done" on your mobile device. 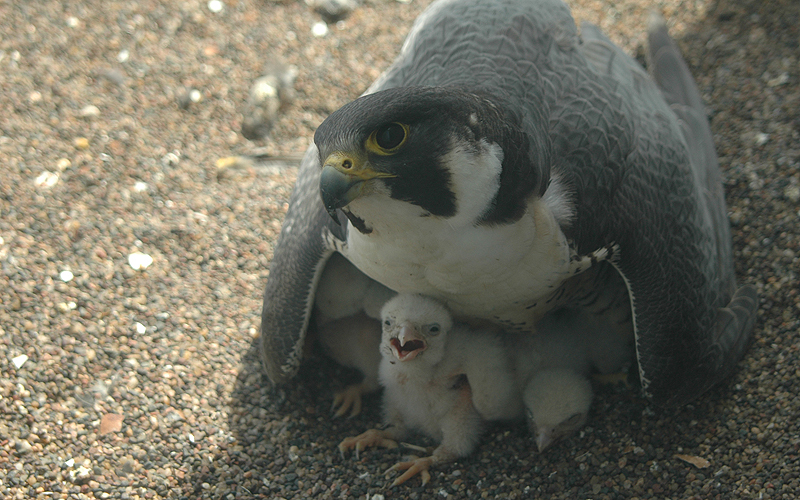 Receive email updates about the peregrine falcons from the Minnesota DNR. The Minnesota Department of Natural Resources' Nongame Wildlife Program is broadcasting a Web streaming video of peregrine falcons nesting on the top of the Bremer Bank Building in downtown St. Paul. 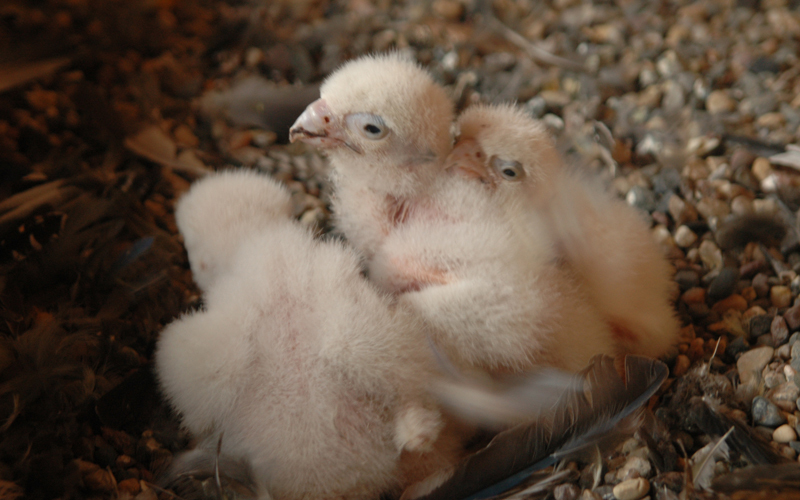 With the help of the Town Square merchants as well as the Midwest Peregrine Society, The Nongame Program is able to provide this unique opportunity to watch peregrines raise their young in an urban setting. 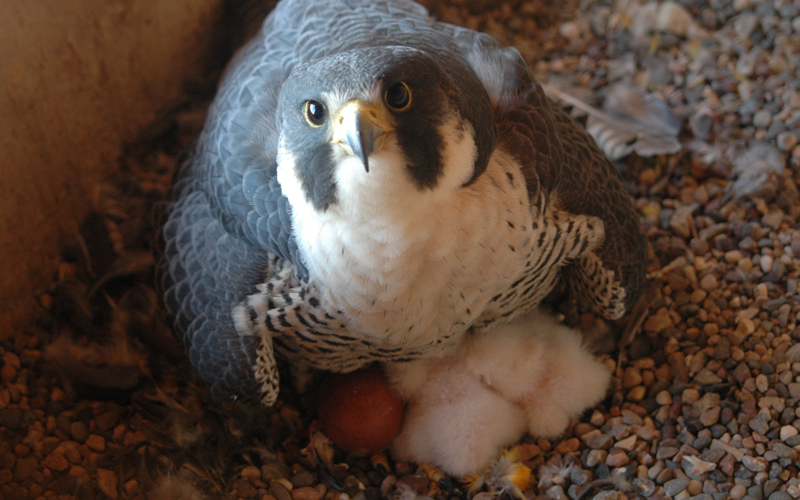 In 1987, a nesting box was placed on the east side of the building and was first used by a pair of falcons in 1988. 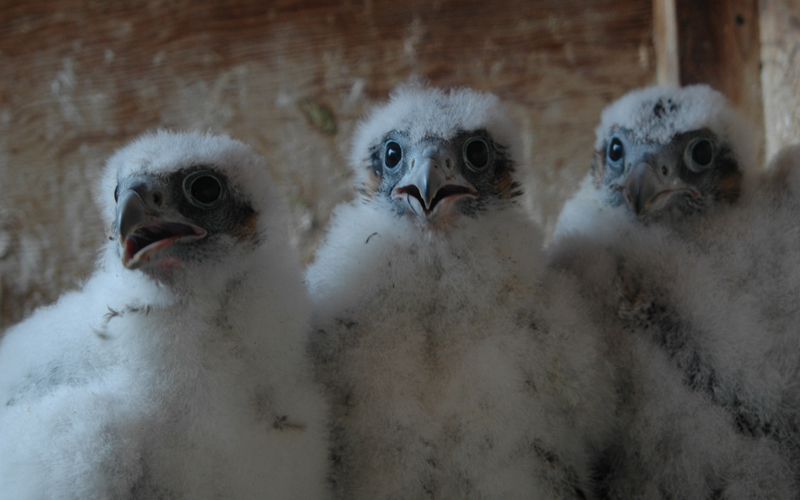 Several pairs of falcons have chosen this site as their home, producing 65 chicks through 2012. Last year was the 9th year that the pair "Jill" and "Sota" had occupied the box. Sota hatched in 1994 and had been nesting since 1998. 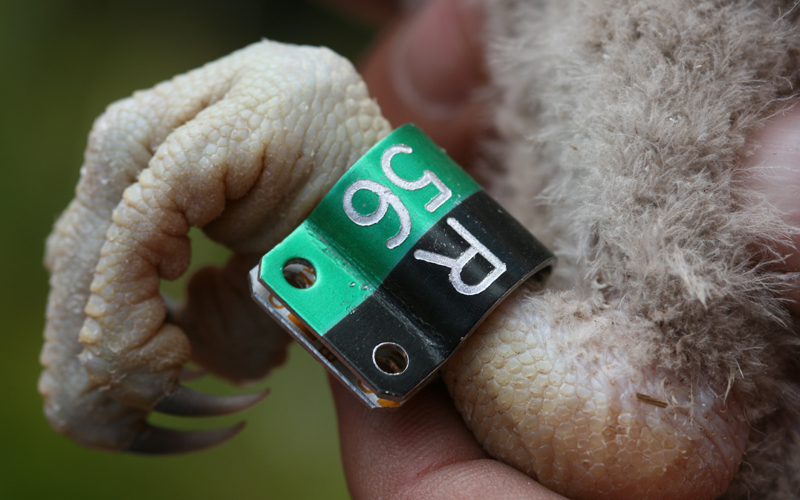 Despite missing two toes on each foot (probably due to frostbite), and being 17 years old, Sota had been able to provide enough food for himself, all of his offspring and his mate during incubation and early brooding of chicks. Unfortunately, Sota has not been seen this season. Jill has returned and has a new mate and they have begun laying eggs. 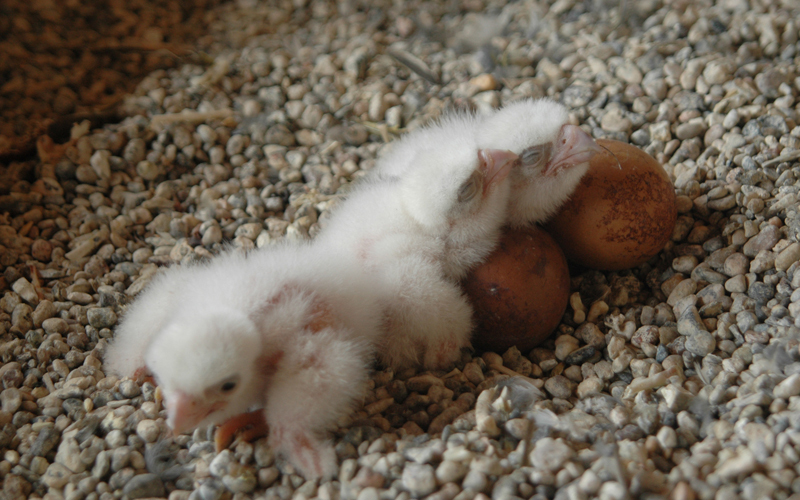 After about a 35-day incubation period, the chicks should hatch close to Memorial Day weekend. 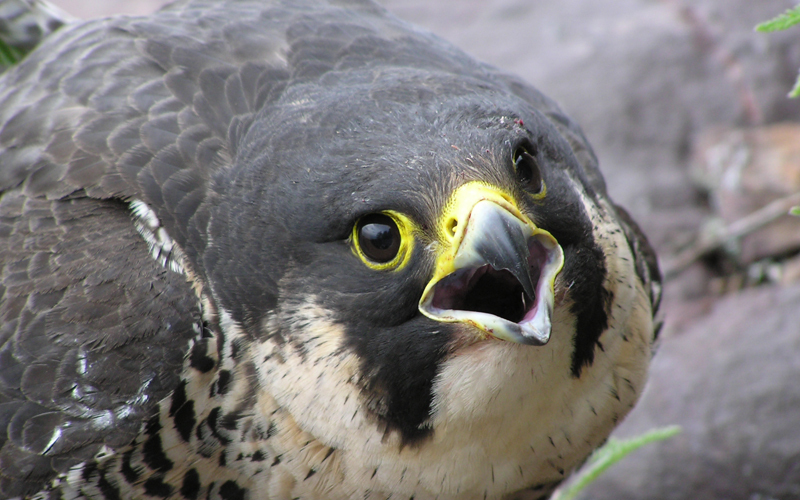 The DNR Nongame Wildlife Program extends thanks to its partners in this webcam adventure: The Midwest Peregrine Society, Sentinel Properties and the Town Square building tenants.